The technologies that have helped enclose us from nature may also help expose us, exposing us to hidden and fragile ecosystems and the common efforts to protect them. Environmental historians argue that the average North American has less contact with the natural environment than any previous generation; we simply spend less of our lives in natural ecosystems. Most of us have never even seen a relatively undisturbed forest, plain, tundra, or estuary. In places like Bonshaw, Prince Edward Island, where the Provincial Government has matched Federal “Atlantic Gateway” funds for a Trans-Canada Highway Realignment through streams and endangered stands of hemlock forest, it might seem like local residents donít know or donít care about what is at stake. Yet, even as excavators roll in, a growing community of digitally inter-connected protesters on the site has ignited a new interest in this small ecosystem and its human and non-human residents. If technology is partly to blame for our complacency and retreat from nature, can it also be part of the solution? The same social networking that distributes protest plans, photos, and videos, is also creating and sharing narratives. From home and from the protest camp in the Bonshaw hills, people are telling stories about what this place, these people, and these forests mean to them. Place is important here. Another way to expose place over time is through historical images and aerial photography. I offer a series of air photos from 1935 to 2010 showing that people have been active — too active — on this place in the past, and that people should also have an active and informed role in protecting its future. Most residents travel through this scenic mix of upland farms and Acadian forest without appreciating its ecological value, historical importance, or its recreational value for tourists and residents of the greater Charlottetown area (the Province’s only densely settled urban area). There are very few land use restrictions in this area. However, when the Province announced it would improve a small section of the Trans-Canada Highway in the Bonshaw hills by paving through Strathgartney Provincial Park it met a strong resistance by local residents and community organizations. This became known as Plan A. The engineers went back to the drawing board and came up with Plan B, which simply followed a longer path through the same landscapes. Only one public consultation was held, where residents were told it was more or less a ìdone dealî pending a satisfactory environmental assessment. Local residents and environmental groups such as Island Nature Trust and the West River Watershed Group challenged this assessment and waged a battle to “Stop Plan B,” but most were told that work would go ahead in October, 2012. The group encountered no concessions from the Province, limited interest from the media, and what seemed like general apathy from the public. Hundreds of signs and bumper stickers went up, and several thousand people signed online petitions, but the sense was that Plan B was fait accompli. As construction was scheduled to begin on Thanksgiving weekend rumours of an on-site protest began to spread, but many seemed to question whether it would be enough to capture public attention or stop construction for more than a few hours. One week into the project dozens of people are still camping out beside the stream bed, occupying the endangered hemlock trees, standing in front of excavators, lining the roads in protest, and facing charges of trespassing. Traditional media have been relatively slow to respond, but the protests have led to a flood of support on Facebook (see group), Twitter (#stopplanbhighway), YouTube (see esp. John Morris) and from more twentieth century technologies such as honking motorists and radio show telephone calls. Particularly poignant points have been made by some of the region’s youngest, and oldest, protestors. These remind us that although governments are only directly responsible to the generation that elected them, their actions are contracts between past and future generations as well. Eric MacPhail, a senior protestor interviewed on the side of the road has been an area resident for over 85 years. In 1935, when Mr. MacPhail was only 10 years old and the largest hemlocks in the construction area were only 150, they were both witnesses to one of the regionís first major state projects. 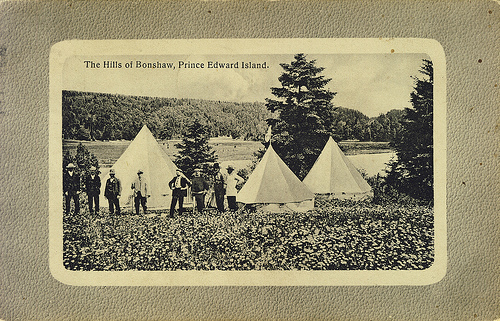 A small aircraft operated by the Geodetic Photographic Detachment of the RCAF crisscrossed the Island taking stereographic photos of the entire Province for the Dominion Forest Service. These air photos were used to create many of Canada’s national topographical maps, road surveys, national park plans, and forest inventories. For historians they show the gradually changing landscape as an intensively farmed agro-ecosystem returned to forest in some areas and became paved and developed in others. The camp in the hemlock grove was one of the few areas still undisturbed in 1935, and it remained so for the last 75 years. Places like these were respected by the Islandís first inhabitants, the MiíKmaq and valued by European residents as sources of fresh water, fish, and forest products. Eric MacPhail has seen a lot of changes in his time in the Bonshaw hills, but hopefully he may not see another ecological injustice in 2012. The number of people and dollars on both sides of the line in Bonshaw are small compared to the Northern Gateway Pipeline or the Melanchthon Mega Quarry, but Plan B comes at an interesting time in PEI history. A recent commission on Land Use and Local Governance has recommended sweeping land reform, and public task force hearings will take place this fall. The Plan B protests will undoubtedly get more people thinking about land use planning and the cost of unilateral development. Air photos are a witness of our active role in changing the Earth; letís add them to our tool belt of technologies that expose us to nature before they become simply another memorial of places we have lost.